Solenn Heussaff and Anne Curtis, together with their beaus - Nico Bolzico and Erwan Heussaff - are currently vacationing in Myanmar for the duration of the Holy Week. The two celebrities have been updating their fans and followers about their trips through posts in their various social media accounts especially Instagram, Twitter and Facebook. Among their latest updates are photos and video clips showing them trying out crickets, an exotic snack in Myanmar. 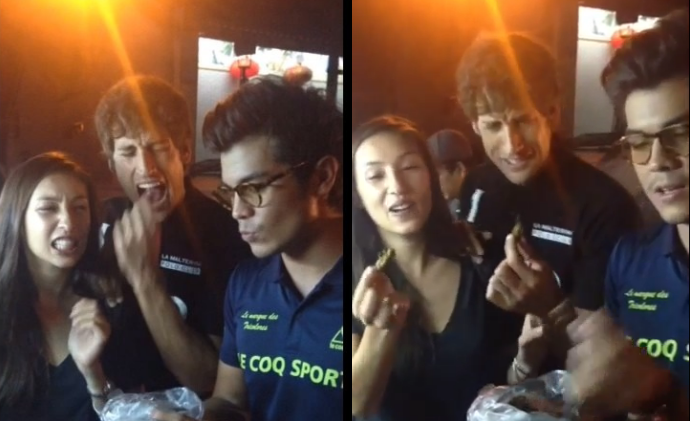 In a video clip, Nico Bolzico, Erwan Heussaff and Solenn Heussaff can be heard daring Anne Curtis to pop in a cricket into her mouth which she did but had to spit it out immediately. Watch the clip below.